The date of implementation of Value Added Tax (VAT) in UAE is approaching and now things are getting clearer about the items that will come under VAT. Several speculations are coming to an end with few clear announcements recently made by UAE government. Few days ago, one such announcement was made by the related ministry that all food items will be taxed from 1st January 2018. Previously, several basic food items were considered to be exempted or zero rated from VAT. This made people worried about the implementation of the upcoming tax on other necessary items also. But a recent announcement is satisfactory for common people. According to UAE’s Federal Tax Authority (FTA), all the supplies for newly constructed residential building with be exempted or zero rated within first three years. The owners of residential buildings are not required to register for VAT. But they should check the requirement for registration in case they had some other business activity. On the other hand, 5% value added will be applied on commercial real estate. This tax will be implemented on all commercial properties. 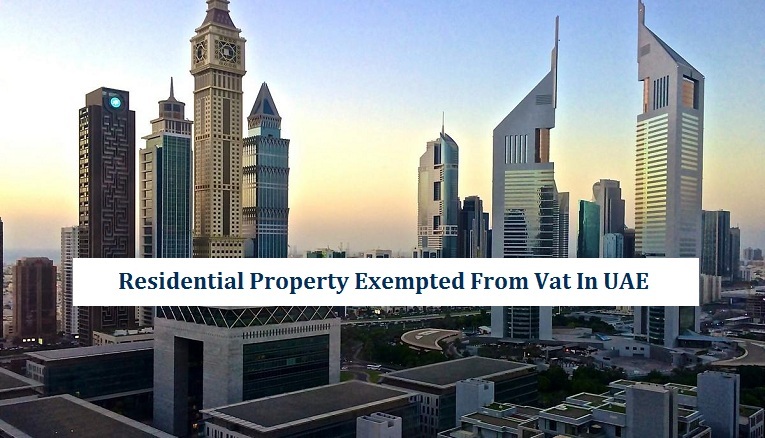 Owners of these properties are required to register for VAT in case their annual profit surpasses AED 375,000 or they are expecting to achieve this margin in the next 30 days. In case a building is in use for both residential and commercial purposes, then it will be treated differently according to its utilization. VAT will be exempted or zero rated on the sale and rent of residential portion of building while the tax will be applied on commercial parts of the mix use building. Just over a month is left in the implementation of VAT in UAE and the eagerness of UAE’s citizens, residents and entrepreneurs is increasing day by day and they want to get complete information regarding the impact of VAT on their daily lives and businesses. Though, tax is a new matter in UAE but there isn’t much to worry as the rate of VAT is quite minimal at just 5%. In most of the other countries, rates of VAT and other related taxes are quite high. The purpose of this tax in UAE and the other states of the gulf area is to made necessary arrangements after continuous reduction of oil and petroleum prices in the international market. I do not suppose I’ve read through something like that before. So wonderful to discover someone with a few unique thoughts on this subject. Really.. thanks for starting this up. This website is one thing that is required on the web, someone with originality! Thanks Calvin for your kind words. Wow.. this weblog is fantastic! I love reading your articles. Keep up the good work! You recognize, a lot of persons are hunting around for this information, you could help them greatly. Yes Mirta, this is right that UAE government has removed VAT from residential property. I am regularly visiting your website and get good data from here all the time. thanks Mona! Simply desire to say your article is amazing. Thank you for great info about residential property! Great to hear, that you find it amazing Nguyen. Thanks on your marvelous posting. I enjoyed reading it! Nice blog for Dubai, UAE updates! Thanks for sharing valuable News.